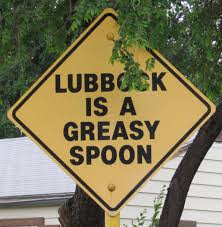 On the last morning of the Good Girls trip to Amarillo, we rode out of town to the heart of the Texas Panhandle. Along the way, I managed to make a wrong turn (a rather common occurrence for me), but it ended up giving us the opportunity to discover Big Tex. Well, you don’t have to do much to notice a 47-foot-tall roadside attraction. Since we’re always in search of a good story, we were excited to find that Tex has one. Tex Randall began life in 1959 as what was then called "Texas' Biggest Texan" -- and he was. The seven-ton slouching cowboy was built of cement and steel by William "Harry" Wheeler, a high school shop teacher, for Wheeler's Western Store on US 60. 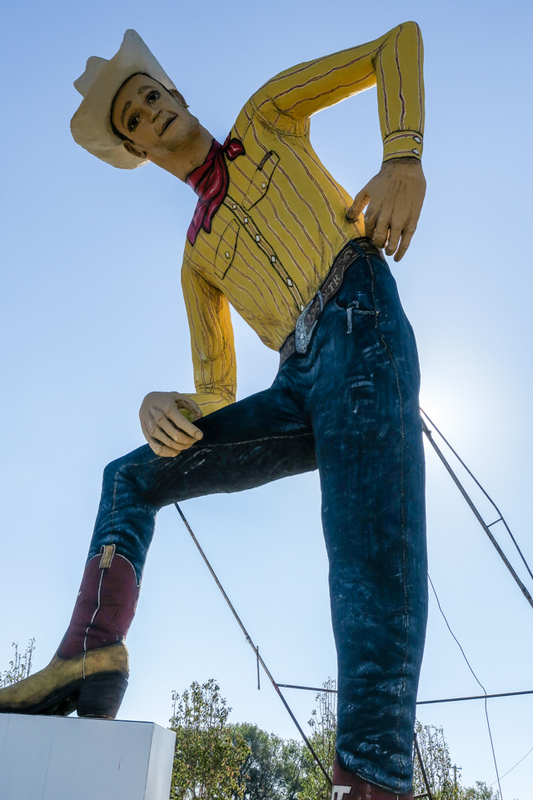 The store sold Western clothing, so the seven-ton cowboy was outfitted with a bandana, a real Western-style shirt, and an enormous pair of Levi's jeans, courtesy of a local tent and awning shop. An ingenious network of steel struts and cables, anchoring him to the ground, supported the galoot’s lanky frame. Decades passed. 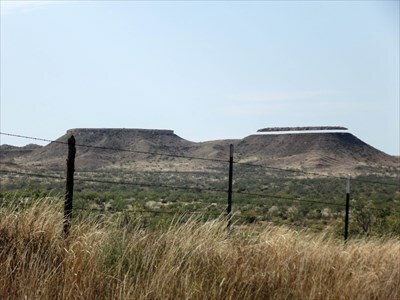 The Texas Department of Transportation rerouted US 60 through an underpass, cutting off Wheeler's drive-by traffic and driving the Western Store out of business. Panhandle winds shredded the cowboy's canvas duds. A semi crashed into his left boot, and the cigarette was shot out of his right hand. Local leaders rallied for a "Save the Cowboy" campaign in 1987. The no-longer-fashionable cigarette was replaced with a spur. The cowboy was given a new face with a mustache, a new set of painted-on clothes -- and a new name, "Tex Randall," in honor of his home in Randall County. More decades passed. Panhandle winds again ravaged Tex, sandblasting away large portions of his skin and clothes. His fiberglass fingers crumbled. 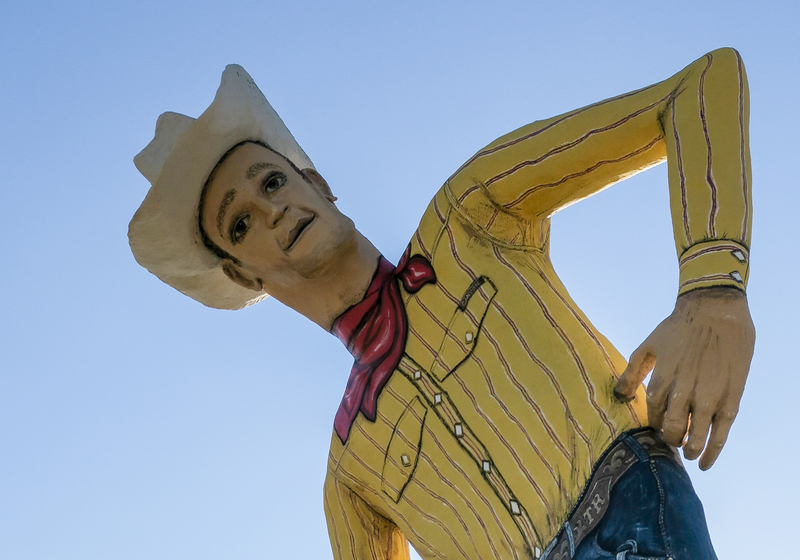 A local businessman bought the cowboy but gave up when he learned it would cost $50,000 to move him. Local boosters mounted an Internet fundraising campaign, but the amount needed to save Tex seemed beyond their reach. Time appeared to have run out for the big cowboy. 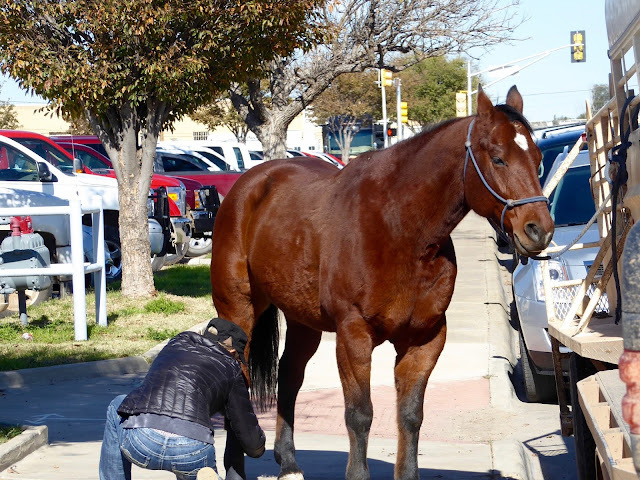 Then an unlikely hero rode to the rescue: the formerly villainous Texas Department of Transportation, which in late 2013 set aside almost $300,000 to turn the land around Tex's boots into a park. Keith Brown, chairman of the Canyon Main Street Program, raised enough money to "re-skin" the statue. Despite Tex's battered appearance, the cowboy was studied by engineers and found to be perfectly capable of handling yet another makeover. Rather hard to miss Big Tex! Repairs began in November 2015, and we were lucky to see the new, better-clothed Tex. He’s no longer the “Biggest Texan, ” but he makes a fine icon for the Amarillo area. 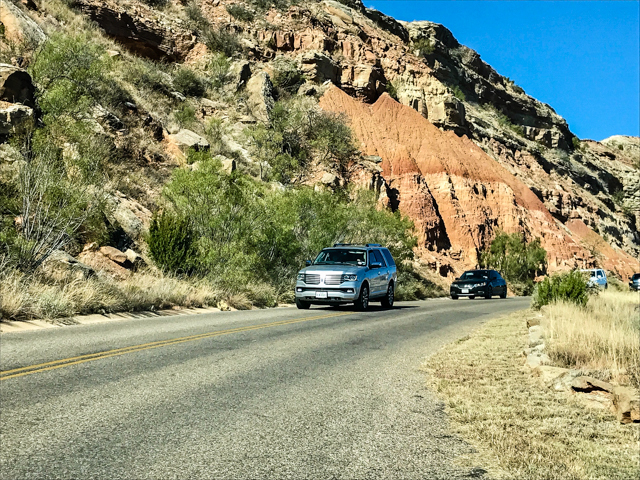 After this brief detour, we found the one and only road that leads to Palo Duro State Park, country route 217, appropriately 16 miles south of Amarillo. We soon reached the entrance and were lucky again. Normally the entry fee is $5.00, but the day we visited was a free for all day. 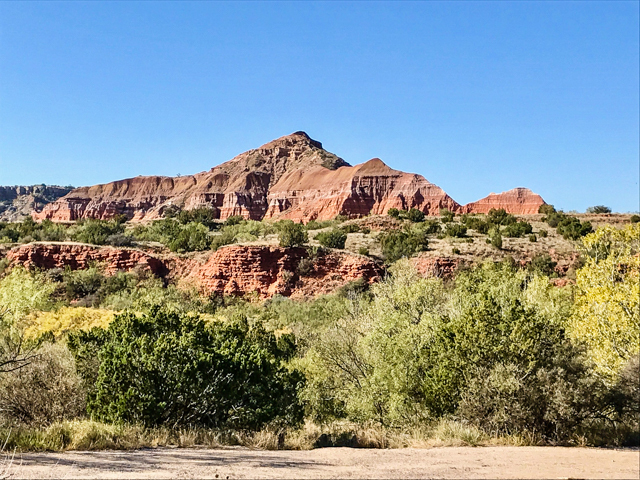 We parked near the rim and began to understand why this is called the Grand Canyon of Texas. 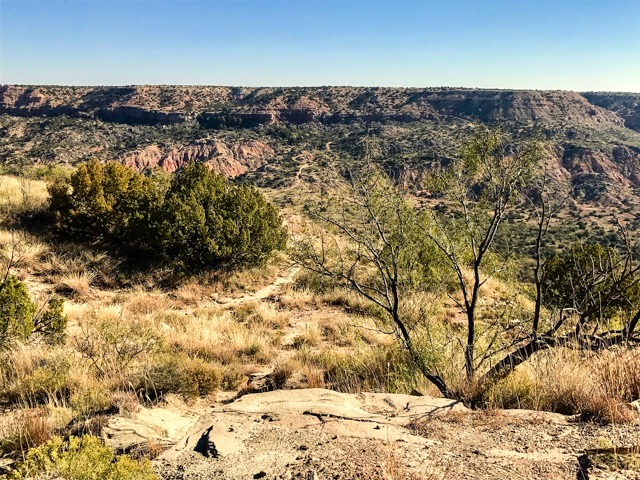 The nickname applies because it’s second largest canyon in the country, which is based on its length (120 miles) rather than depth. The rim elevation stands 3,500 feet above sea level, but it’s only got a maximum depth of approximately 800 feet. To compare, the Grand Canyon in Arizona is 277 miles long, 18 miles wide, and 6,000 ft. deep. Where does the name come from? Legend claims the early explorers who discovered the area, dubbed the canyon "Palo Duro. That’s Spanish for "hard wood," a reference to the abundant mesquite and juniper trees. We peered over the edge and were impressed by the splendor of the bushy and wooded areas juxtaposed against the clay to fiery reddish rock bands and cliffs. We noticed the main ranger station, however, it was closed on this Sunday morning. We picked up a brochure and sure enough, learned that the building we thought looked like a CCC construction indeed was! The Civilian Conservation Corps of the 1930's constructed most of the buildings and roads still in use by park staff and visitors. 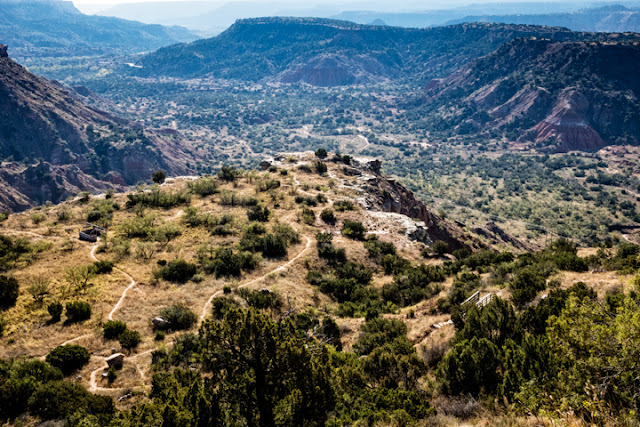 There is evidence of settlement in Palo Duro Canyon for around 12,000 years. In more recent times, the Apache, Cheyenne, Comanche and Kiowa tribes inhabited the area for various periods until 1874. 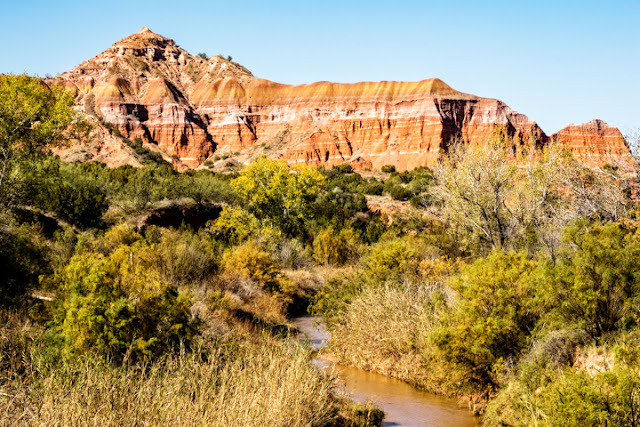 That year, they were forced to move west into Oklahoma, as a result of the Red River War that displaced Native Americans all across the southern plains. 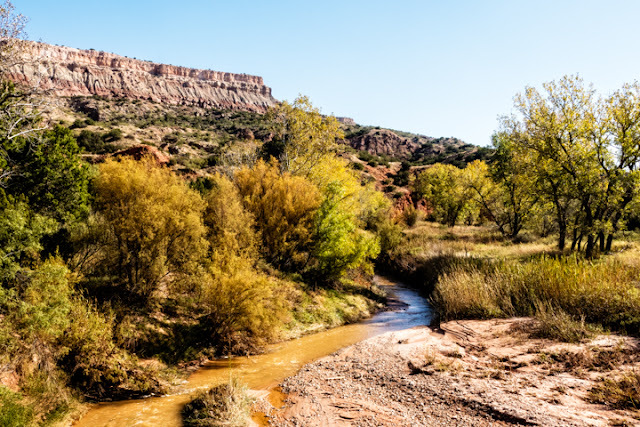 Soon after the clearance, the 100,000-cattle JA Ranch was established and the canyon remained privately owned until it opened as a state park in 1934. Our plan was to drive the park loop, stopping for photo ops, rather than hiking a trail. So, we started down the steep road pausing once to appreciate the stunning view of the canyonlands. When we reached the bottom, we found the Trading Post open so went in for a look. As expected, the shop carries food and all the sundry items campers and hikers might be looking for, but nothing special. We weren't the only visitors driving the Canyon Loop road. Next stop was the trailhead of the Lighthouse Trail, a 6-mile path to the most famous formation in the park. Some folks rode bicycles over the ruddy trail, but we weren’t ready for a six-mile escapade. We wanted to capture shots of riders on horseback but found none. So, we drove on, noting the well-developed infrastructures like campsites, car parks, and pavilions. Obviously, this park is well-used, a good thing. Campers need reservations, especially during the summer. We crossed over streambeds six times. Thankfully, there were no flash floods that day, but there were warning signs. We completed the loop, stopping again and just letting ourselves enjoy the beauty of the Southwest. The only rodeo I ever attended was years ago in a small town in South Dakota. I ‘d certainly never been to one with hard working ranch hands and real cowboys. I was ready for some action. From the moment the arena lights were dimmed and the announcer took to the mic, excitement could be felt. The various contestants rode in bearing flags from their state and ranch. After all were on the floor, a rider circling the arena proudly presented the American flag. A rousing version of the National Anthem was sung by the crowd. These ranchers are a patriotic group and they showed their true colors. Bringing in the flag. Photo by Judy Wells. First up was the Ranch Bronco Riding event or what I’d call bucking Broncos. 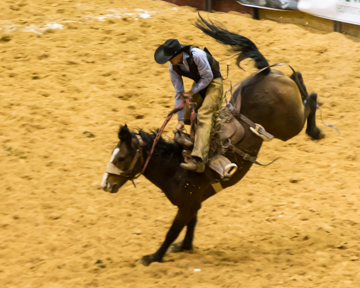 No bull-riding here, ranchers must break their horses and these guys are the best of the bunch. The rules say to “Ride as ride can” for eight seconds. Eight seconds can be awfully long when you are on these wild horses. I can’t comprehend the impact this must take on the body, but these cowboys struggle to control the assigned horse in the allotted time. 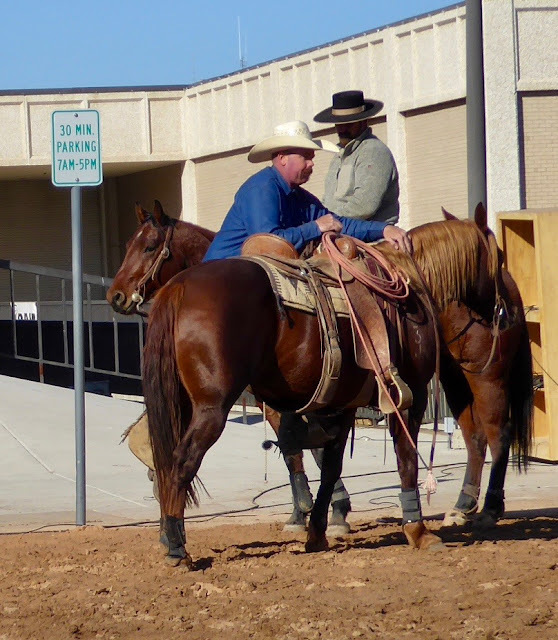 In case they fall off, and some do, clown cowboys try to attract the riderless horse away from the fallen contestant. This event really grabs your attention. Next was Roping or officially, Stray Gathering event. 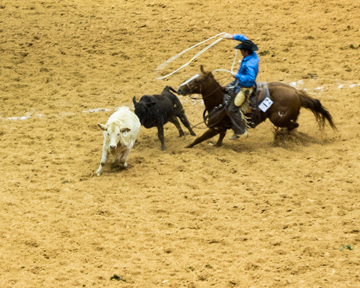 A group of four riders enters one end of the arena while cattle enter the opposite. 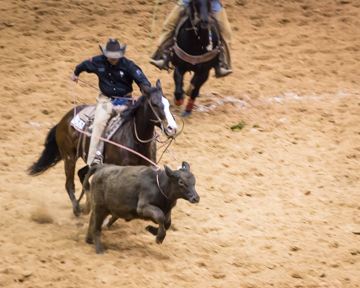 The riders are timed as they try to single out and lasso a calf. Then their helpers jump off their horses and tie the calf’s head and feet. When the steer can no longer escape, the clock is stopped. Wild Cow Milking proved to be a bit humorous. This event includes another four-man team: a roper, milker and two muggers! Only the roper is on horseback. (Honestly, the term mugger is what they are called.) 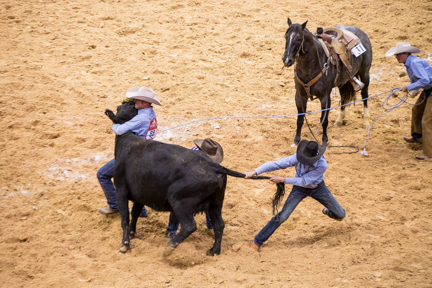 Like roping, cows were lassoed but this time held down by teammates. One is assigned to get milk and must run it up to a judge for verification. The judge will pour the milk out of the bottle. Sometimes, there is not enough milk and sometimes the cows break away. The crowd responds with enthusiasm or laughter. Team Penning was one of the most fun events. Teams of four riders are assigned a number. All the cattle are marked with numbers, so the contestants must pick out the correctly numbered calves, and move them down to the opposite end of the arena and into a pen. Often times two or three of the needed four are penned, tbut hey somehow they make a fast break and escape, causing the riders to start all over again. Judy says: This task can take a l-o-o-o-n-g time to complete because most calves want to rejoin the herd. For some reason it took all four team members to cut the laggards out and herd them to the others which gave the others plenty of time to find the open gate and escape. Never could figure out why one team member wasn't left behind to tend the penned ones. 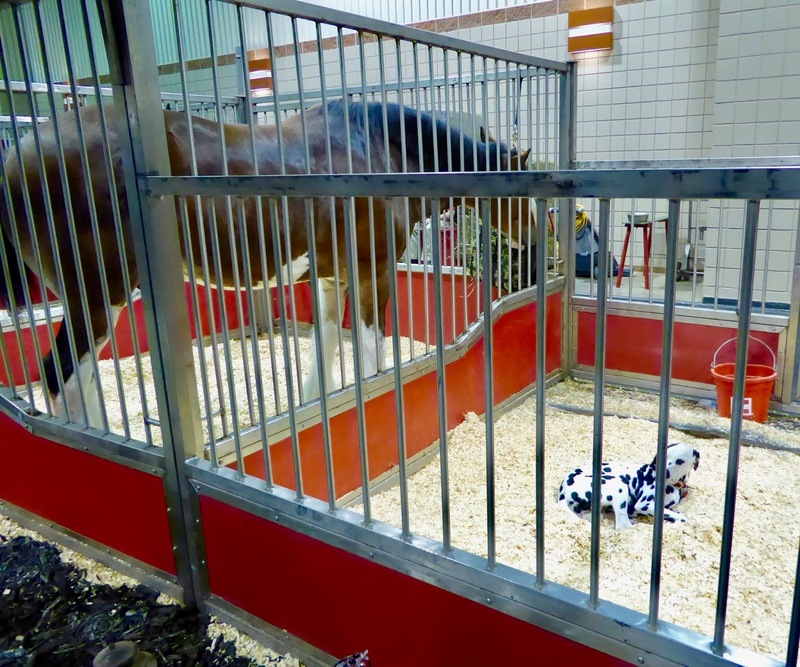 During a break in the contests, the Budweiser Clydesdales Team and Beer Wagon, complete with a Dalmatian riding on top, entered the track. These huge beautiful beasts prance so delicately. I especially loved when they crisscrossed their hooves, side stepping to turn the wagon 180 degrees. These are expertly trained performers and a real joy to watch. Judy says: Dressage fans will recognize that as coming from the half-pass (which the Clydesdales did crossing the arena at a diagonal) and to see these behemoths handle it like dainty ballet dancers is remarkable. 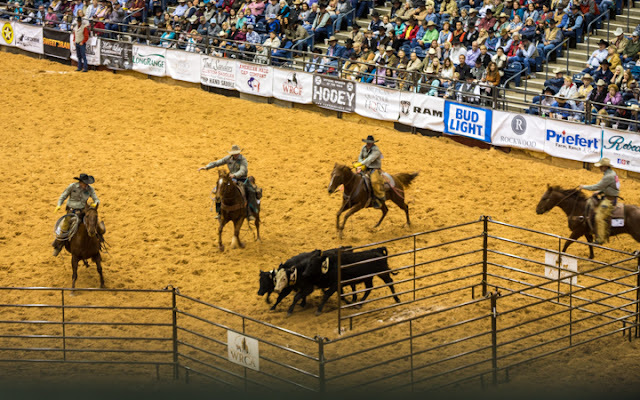 Team Branding consists of four- to six-man teams: a roper, two flankers, a brander and two herd holders. Two calves must be roped and pulled to what is called the fire. 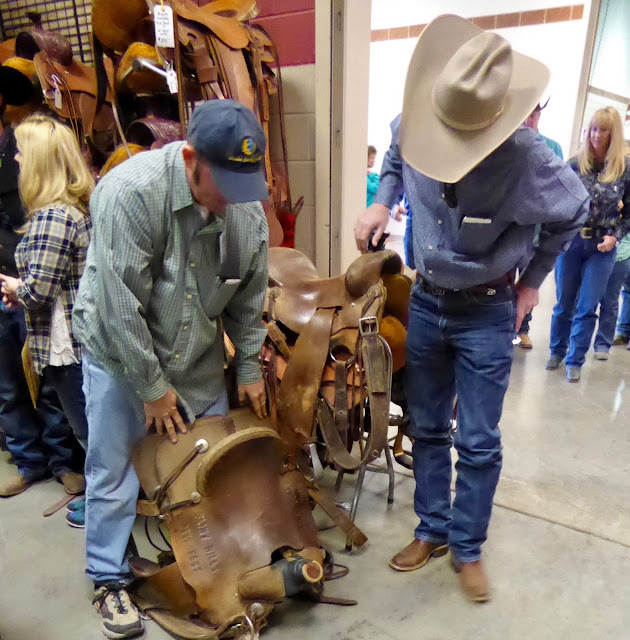 But, at the rodeo, these calves are not really branded with a hot iron. They used some sort of dark chalk. Two teams compete at the same time, so there are anxious moments between teams. The night ended with a second group of competitors in Bronc Riding. 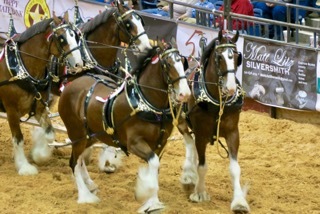 These horses didn’t seem to buck as wildly as the first group. But, maybe I’d just gotten used to all the action. I especially loved trying to take photos of the horses when all four feet when in the air. I found the Ranch Rodeo absolutely fascinating and the time flew by. I was sorry when it ended. I would definitely go again if I lived in Texas. Hee-Haw! 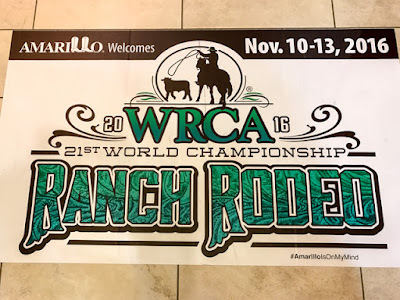 Judy says: Teams qualify by competing in 22 sanctioned Ranch Rodeos in Colorado, Kansas, Oklahoma, New Mexico, Texas and Wyoming throughout the year. 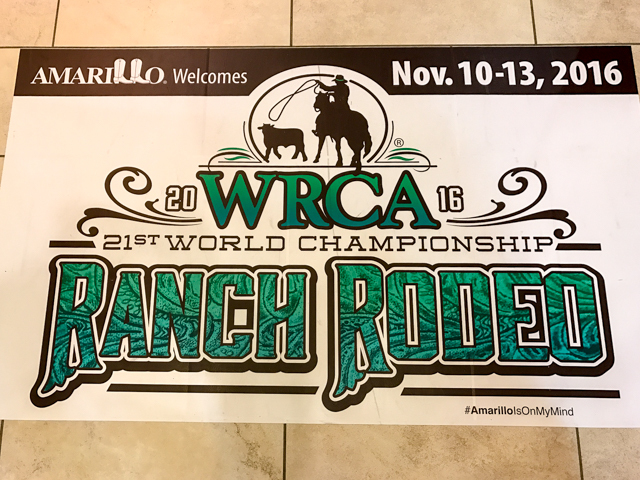 The WRCA Championship Ranch Rodeo in Amarillo goes on four days, with half the teams competing per night. Championship is announced and prizes are awarded on the final night (Sunday). 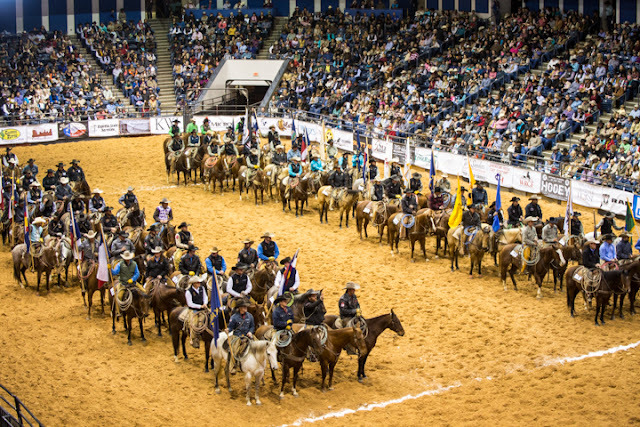 During the day, competition for junior riders fills the arena and performances by cowboy poets and musicians take over the complex's large side rooms so there is always something to see. 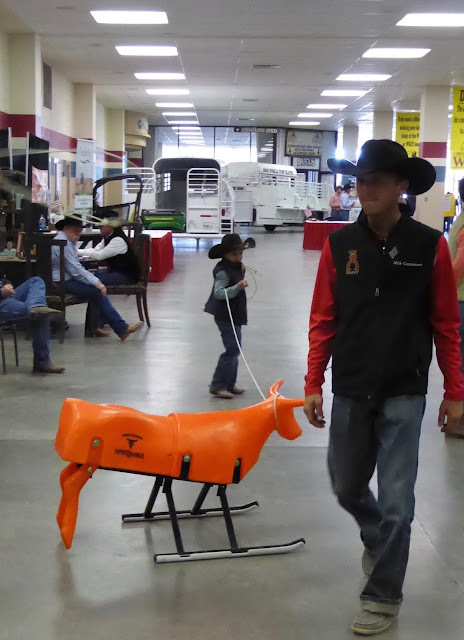 The horses used by the teams are judged as well as those back at the ranches. Ranches, by the way, are rarely in one location; many have operations in more than one state. 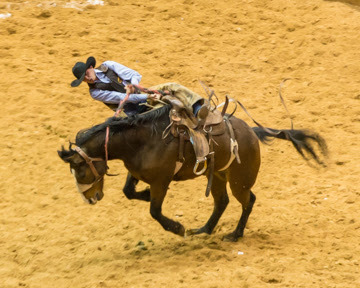 Each year the ranches are judged on the quality of their remudas, cowboy for the herd of horses used by the cowhands. It is the ultimate award for a ranch owner. Sportsmanship is key and it is normal for one ranch to assist another, even during a competition. If a team finds itself short of a rider, they can borrow one from a competing team! Time's up, better mosey along. Photo by Judy Wells. Buses, trucks and trailers are nothing new to civic centers that host traveling shows, but one doesn't expect to see cowboys parked in 30 minutes-only spots or checking their horse's hooves on the sidewalk. A little TLC to the leg. Photo by Judy Wells. When ranchers and cowboys converge, those who cater to their needs are never far away. The Amarillo Civic Center Complex is large and we found them all. Actually it was hard to miss. The Budweiser Clydesdales and their spotted Dalmation pal were stabled at one end of a large display room for close-ups with their fans. The Ranch Expo filled the middle with trailers, cattle chutes, portable corrals, animal health products, feeds, ag investment firms, chemicals and heavy equipment. 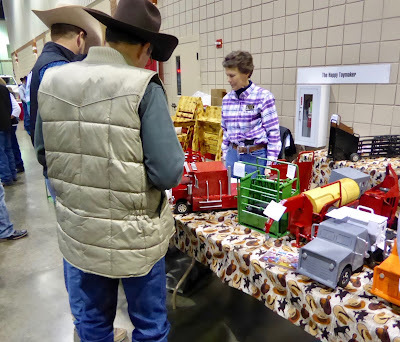 At the opposite end a portable corral teemed with buckaroos trying out miniature versions of the pens, trailers and heavy equipment. Cowgirls were putting together stalls for their horses and farm animals. 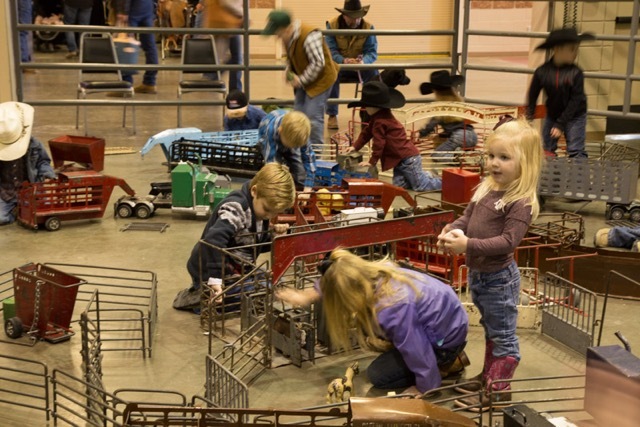 At a nearby table, indulgent dads were buying miniature versions to keep their buckaroos happy at home. 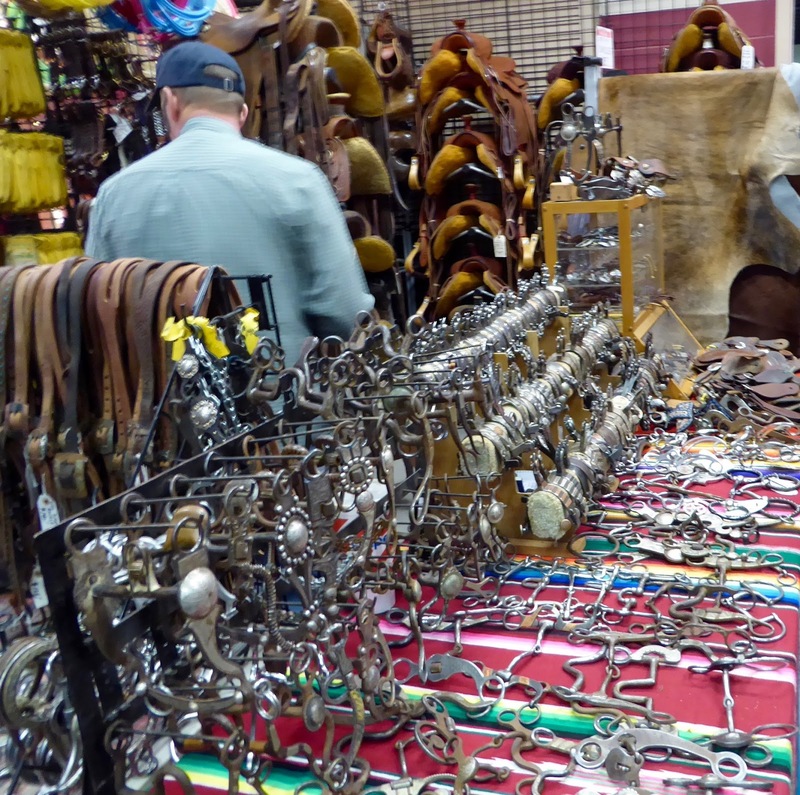 Bits and bridles and saddles, oh my. Photo by Judy Wells. 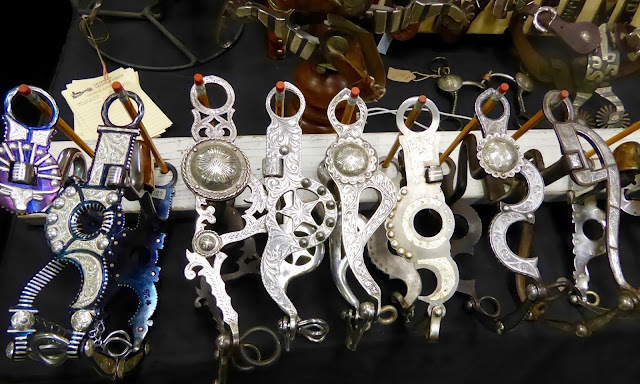 The Cowboy Collectible and Trappings Show, 150 hand-picked cowboy craftsmen and collectors, filled an adjacent room with bridles, bits, braided reins, handmade knives, saddles, saddle blankets and halters for starters. 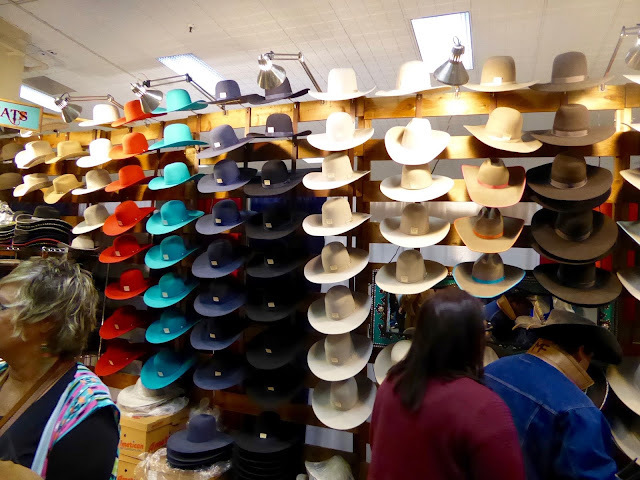 Some shoppers were looking for tack to use, others for collectibles. Boots in every color of the rainbow with customized-while-you-wait hats to match, shirts with pearl snaps, fringed jackets and purses, jewelry, apres round-up or rodeo attire and even high-end ranch-style furniture and decor. 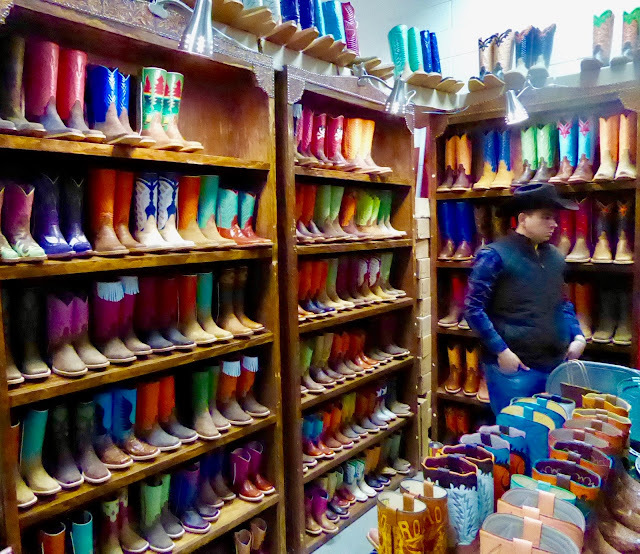 Hand-tooled belts, custom buckles and leather chaps could be overlooked amid the merchandise. Debi even found the perfect vest for a travel writer; no one else in the world is likely to have one like it. She calls it her "yak vest" because it resembles the white yak she rode in China. There was so much we kept thinking we had found an unexplored area only to discover midway in that it suddenly looked familiar. Randy Norris ran the show. Photo by Judy Wells. 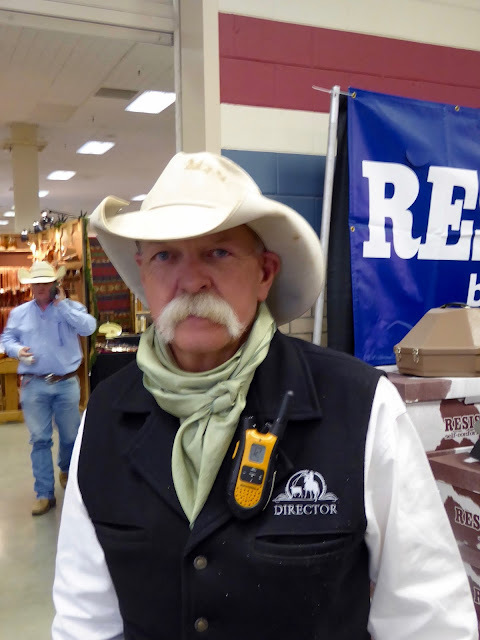 We caught a cowboy musician's performance, chowed downed with the volunteers and contestants, admired the silver mustache of WRCA President Randy Norris of New Mexico and watched young cowboys-to-be practice roping plastic calves. It was all we could do to keep from buying a horse so we could outfit it and ourselves in style. You couldn't ask for a better first act for the rodeo that night. Roadside attractions are an American phenomenon. It's an endearing phenomenon that towns many think are in the middle of nowhere become somewhere when people exercise creativity, put tongue in cheek and take advantage of that wide open space. The best part is when those efforts take on lives of their own that their makers never anticipated. 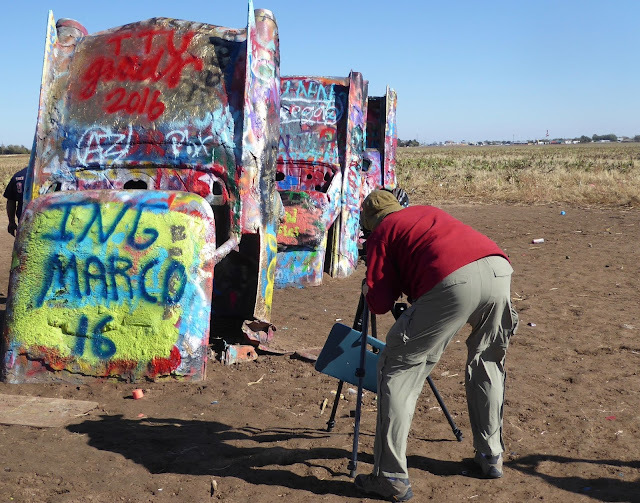 Cadillac Ranch. Photo by Judy Wells. 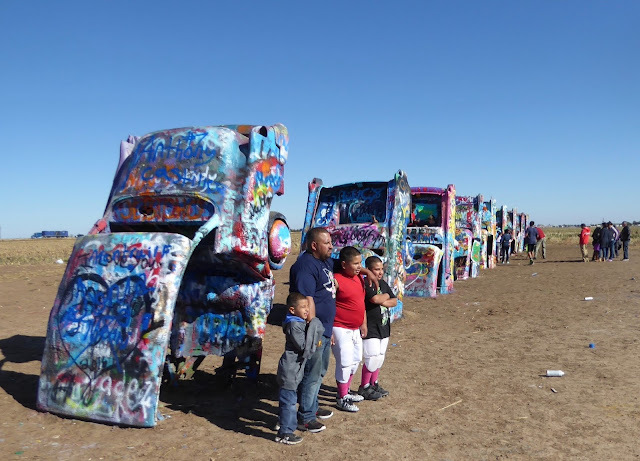 Count on the Good Girls to seek these out so our first stop had to be the Cadillac Ranch. 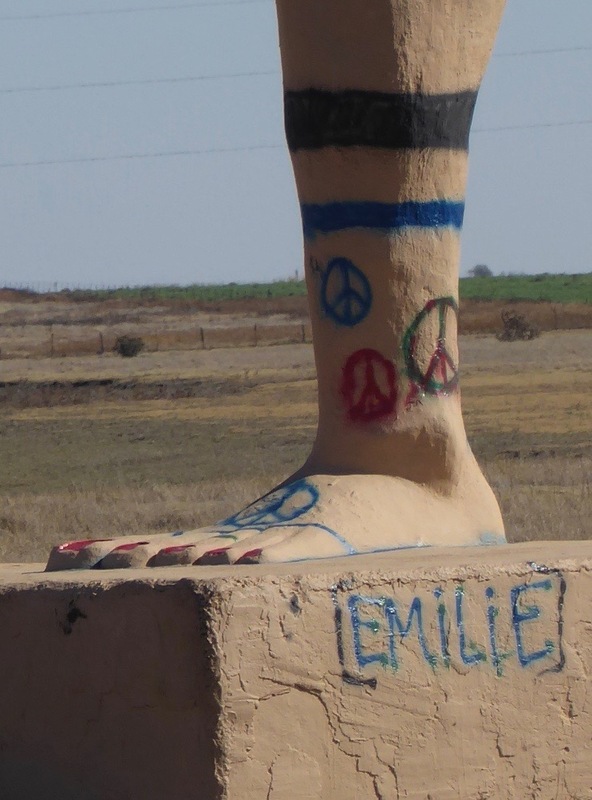 It used to be on Rte 66 but a growing Amarillo prompted a move in 1997 few miles west to a spot off Interstate 40. Just look for the cars parked along a side road. The installation charting the evolution of Cadillac's tail fins (1949-1963) was the brainchild of Chip Lord, Hudson Marquez and Doug Michels, part of the Art Farm group of architects and artists. They approached millionaire Stanley Marsh 3 of Amarillo, who had a penchant for non-traditional art, and the rest is history. And 10 Cadillacs partially buried nose down supposedly at the same angle as the Great Pyramid of Giza in Egypt. Take a colorful ride into the imagination. Photo by Judy Wells. The adults of a Hispanic family were looking closely at the tipped cars while their younger sons were "sitting" in one pretending to drive it and the oldest one spray painting others. Spray on. Photo by Judy Wells. It's what you do at the Cadillac Ranch. 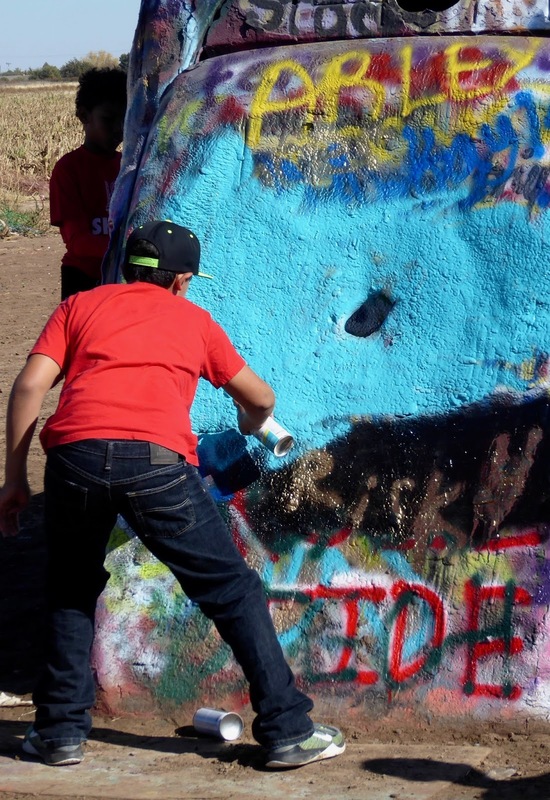 Spray painting is what people have been doing since the installation was finished in 1974. The cars have been all white for a commercial, pink for the birthday of Wendy, Stanley's wife. All were painted black when Doug Michels died and in 2012 the installation became a rainbow to commemorate gay pride. Sometimes a coat of paint is added to give visitors a fresh canvas. It was about time for that when we visited. Focusing on art. Photo by Judy Wells. We chatted briefly with a couple from Connecticut. She was taking snaps while over and over, he positioned his tripod for exactly the image he wanted. That's something visitors do, too; take pictures. What I did was marvel at how people from all over the world had made a line of oddly placed cars their own. I doubt if any of its creators had any idea how it would be received or that the public would want to add their names, colors, thoughts or scribbles to its "bodies." The Cadillac Ranch has transcended itself and truly is a living work of art. Cadillac Ranch jewelry by Bob "Crocodile Lile. It is only natural that visitors would like a souvenir to take home. There's a guy who is often at the site who sells tacky ones out of the back of his van, but there is a much better option. 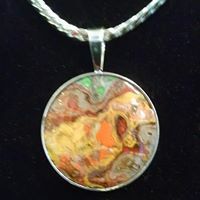 Artist Bob "Crocodile" Lile at Lile Art Gallery in Amarillo creates beautiful jewelry from paint chips he finds on the ground at the Ranch. 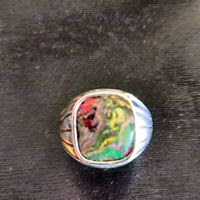 Opaline silver pendants, bracelets, rings and earrings are tasteful, unique works you will be proud to wear. Trust me, no one will suspect their "stones'" origin. 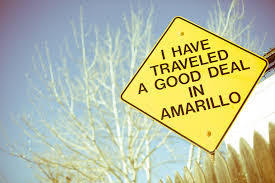 It isn't the only art installation the late millionaire Marsh gifted to Amarillo. I saw one of the bogus street signs that make up the "Dynamite Museum," but there are many more that survive the wear and tear of weather and paint-overs. We didn't see the "Floating Mesa," another Marsh-funded project, a little north of Amarillo because atmospheric conditions were not right. When the sky is the same shade of white as the band of plywood panels across the side of the mesa, it appears to be floating. Then there are "The Legs." Photo from afar by Judy Wells. I don't remember where we first heard about "the big legs" but everyone we mentioned them to, shook their heads and muttered, "You want to see those things?" Yes, we did, even after being told it was a joke and the official-looking plaque wasn't. We persisted despite wrong turn after wrong turn. Not knowing exactly what to look for, we were driving right by them. 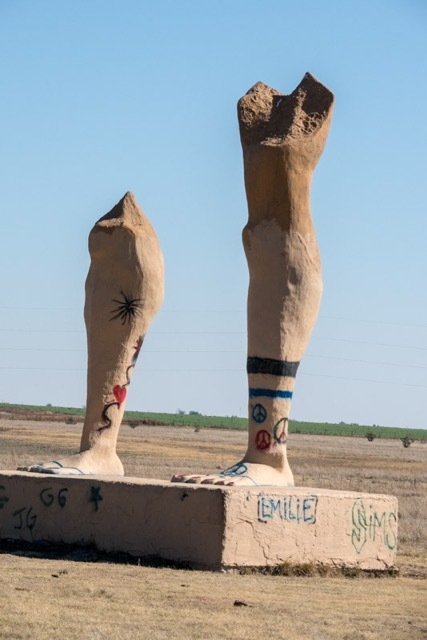 The Ozymandias legs. Photo by Debi Lander. At first glance, the old Peggy Lee song, "Is that all there is?" came to mind and we understood the discouraging comments. Then I saw the official-looking plaque and started reading. And laughing. Shelley might be rolling in his grave although he wasn't above pulling a prank or two himself. Perhaps we were both laughing. And on the pedestal these words appear. The lone and level sands stretch far away. " "The visage (or face) was damaged by students from Lubbock after losing to Amarillo in a competition. A stone cast of it will be replaced when ready. The original is on display now in the Amarillo Museum of Natural History. Souvenir hunters have scraped off the bottom of the pedestal but archeologists have determined that it was as Shelley described it." Can't you just imagine a group of beer-drinking students, surely an English major and an art major among them, sitting around coming up with a roadside attraction of their own? I understand the crew sock marking and some graffiti was added by someone after installation so the legs may evolve into something deeper than an elaborate student prank. In the meantime, thanks for the laughs, kids. 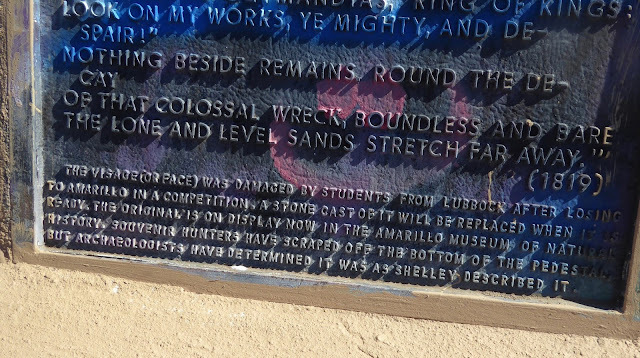 Also, now we know there is a rivalry between Amarillo and Lubbock which explains the Lubbock sign from the Dynamite Museum. 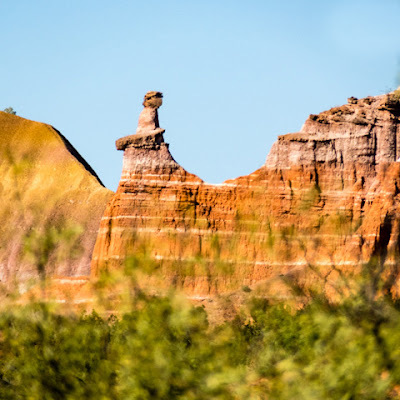 Not all roadside attractions are equal but even the worst make for interesting detours and bring a touch of whimsy to otherwise ordinary road trips. 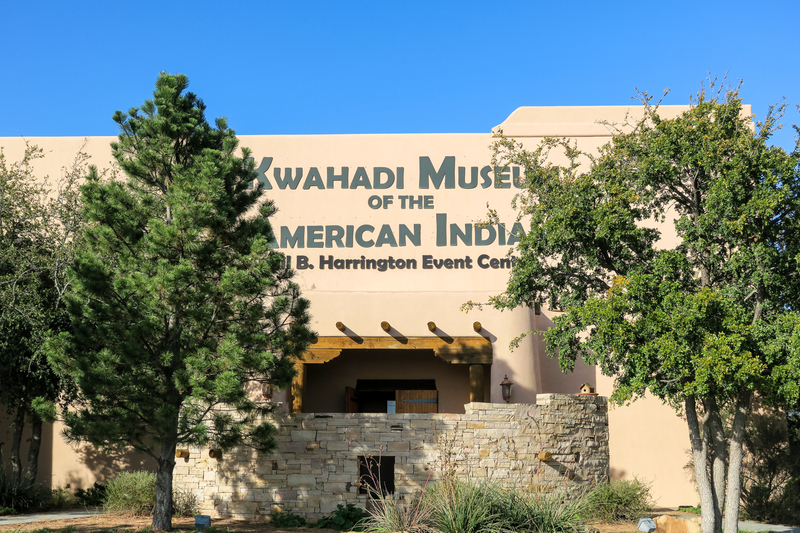 The Good Girls went to Texas to see the rodeo, but we took time out to visit the Kwahadi Museum of the American Indian one day. The exterior building does not begin to tell the story of what’s inside. We were met by Charles Ritchie, the Director, who is just the right man for the job. He’s both compassionate and passionate about the center. You notice the adobe architecture building from along I-40. Inside it contains a museum plus an entry room with lots of paintings, a Great Room for performances and a fabulous gift shop. We found it all quite a splendid surprise. The center or Kiva is the home of the world famous Kwahadi Dancers as well as an amazing collection of Native American art and artifacts. The Kwahadi Dancers began in 1944, but this, their own building, did not open until 2004. The museum presents a varied collection of arts, books, costumes, artifacts, and paintings. You can see works by the late author and artist, Thomas E. Mails, covering 14 native cultures. 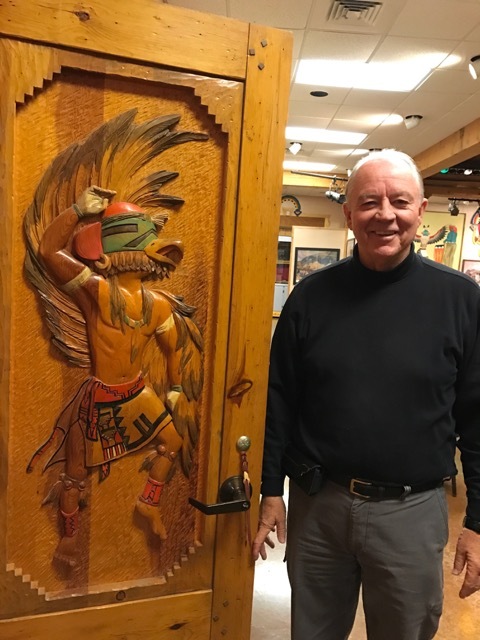 Nature enthusiasts will love the detailed carvings of the Birds of the High Plains by Bob Jones. 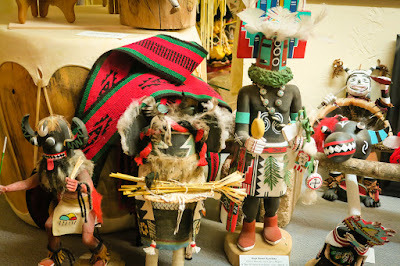 I enjoyed the many kachina dolls and handmade crafts and costumes by tribe members. Judy found a horse dance stick, probably Lakota, that had been danced with in the gift shop to add to her collection. 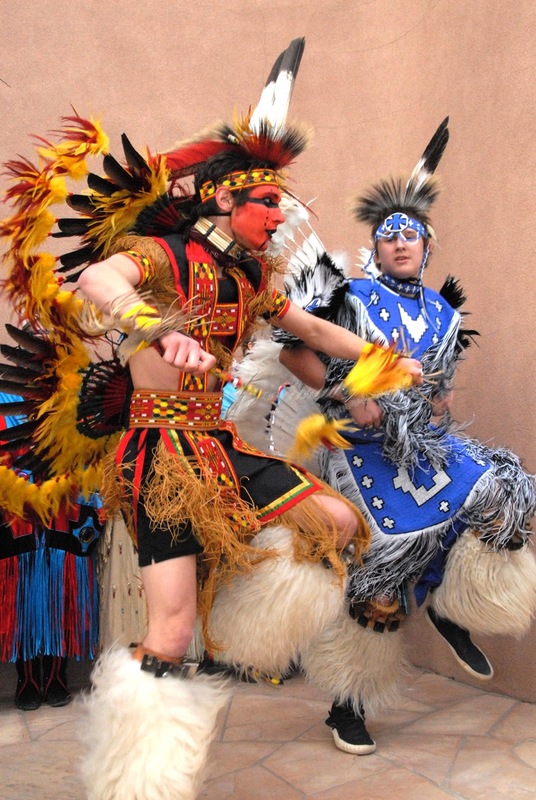 We were surprised to learn that the dancers are not Native Americans. It began as a World War II era Boy Scout project. These are everyday normal Amarillo school students, male and female (plus the occasional tag-along little brother or sister) who’ve been encouraged and inspired to join and learn. They perform at the museum throughout the year, and travel during the summer and special occasions. They have danced in 48 states and overseas too. The Texas Commission for the Arts awarded the Kwahadis the Youth Award for Excellence. From a list of prestigious invitations, they were chosen to represent the U.S. at the International Festival of the Arts in Amman, Jordan and were selected by the International Olympic Committee to represent North America in the opening ceremonies of the Xtreme Games in South Korea. Their performances are based on Comanche dances but are interpreted by the Kwahadi’s. 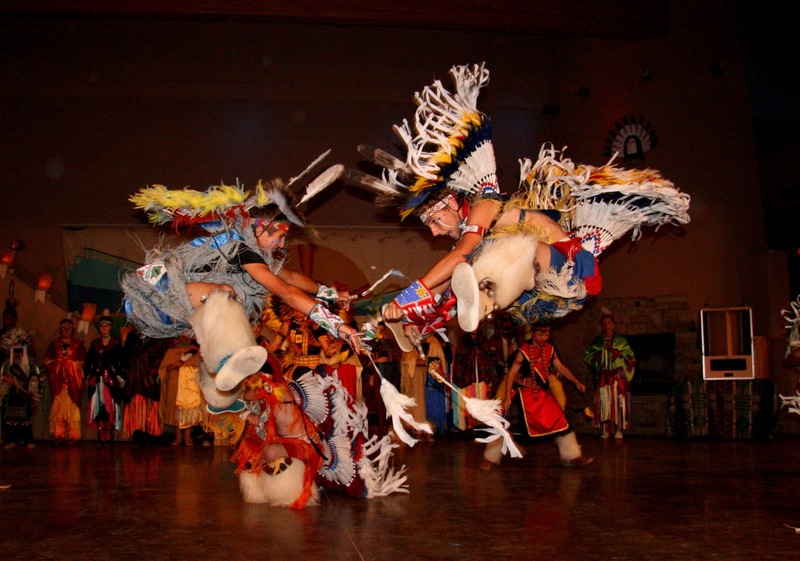 That name was given to the young dancers by the Elders of the Comanche Nation who were also known as Kwahadis. 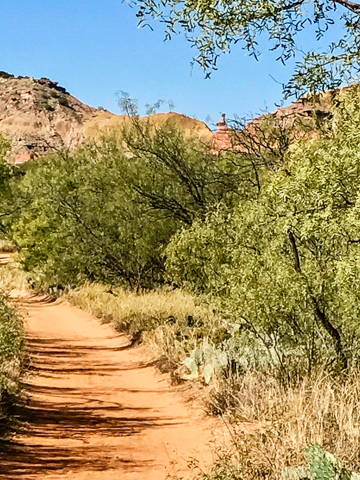 The dances journey into the folk art of the Southwest, demonstrate prayers and thankfulness for rain, the hunt, and harvest. Some honor our flag and soldiers. They tell stories and encourage folks to believe that persistence can make dreams come true. Through learning and performing, the students experience the rewards of good choices, high goals and commitment. Ritchie said that many of the past members went on to college, something that seemed beyond reach before their involvement with the group. We were very disappointed that we couldn’t watch a performance. If you are ever in the area, or if the Kwadahi Dancers come to your town, by all means, go see them. 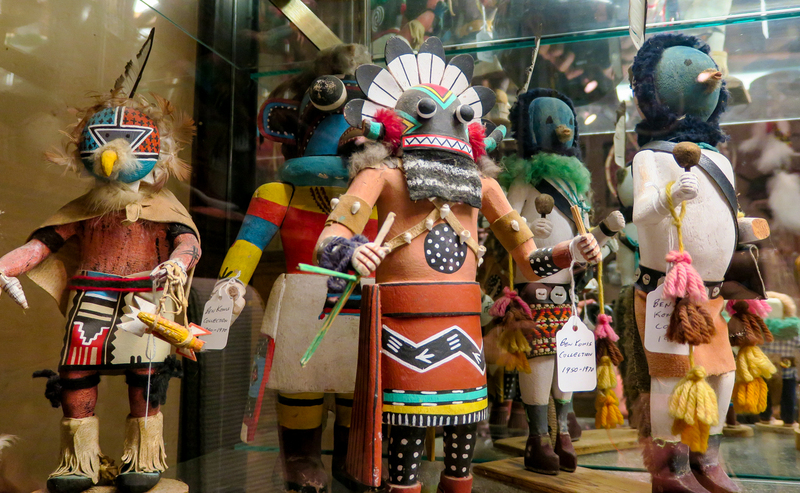 And, if you are interested in Native American art, stop by the museum.